Not all losses are bad ones. Not every victory brings smiles and high-fives from the winners. Camden High head wrestling coach Daniel Sisk and assistant coach Shawn Armstrong let 170-pounder Jalen Holliday make the call as to whether Holliday wanted to wrestle North Central sophomore Kalab Haven in the finale of Tuesday night’s showdown inside the Dog Pound at Camden High. With the Bulldogs having already sewn up the match, leading 45-27 over the state’s top-ranked class AA-A entry, and having already wrestled and lost to Haven in the finals of Saturday’s Blue Devil Invitational at Dreher High School, Holliday wanted to test himself, again, against the top-ranked AA 185-pounder in the state who weighs in at both 170 and 185 pounds. The decision took a wrong turn with less than 11 seconds remaining in the second period as Holliday signaled for help from CHS head trainer Vincent Albano as he lay on the mat while signaling to the area near his left ankle. Upon seeing the injury and the pain Holliday was in, Sisk immediately signaled to the official to end that pairing and the contest as the hosts handed the Knights their first dual match setback of the season after having won their first 28 straight, 45-33. For the Dogs (19-3) and ranked ninth in the most recent scmat.com AAA state poll, it was their 13th win in their last 14 outings but it could have come at a cost, depending on the severity of the injury to Holliday, the top-ranked 170-pounder in class AAA. “The match didn’t really mean anything at that point and I asked Jalen if he wanted to go,” Sisk said. “(Haven) beat him last weekend and he wanted to go and try to get revenge. Holliday was still lying on the mat being tended to as both teams stepped across the surface for the post-match handshake. When he was helped to his feet and carried off to the locker room, NC head coach Jason Brazell stopped his post-match interview to applaud along with the rest of those in attendance. With the final result not in doubt, Haven took a quick 5-0 lead over Holliday before the Bulldog senior narrowed the gap to 5-3 with a takedown in the opening seconds of the second period. Haven then had a near fall and takedown awarded as Holliday was taken to the mat with his ankle injury, putting an early end to the highly-anticipated pairing. Some of the luster was taken from the night before that meeting as both sides battled injury, illness and weight issues. Both teams forfeited two matches --- and, 12 points ---each. 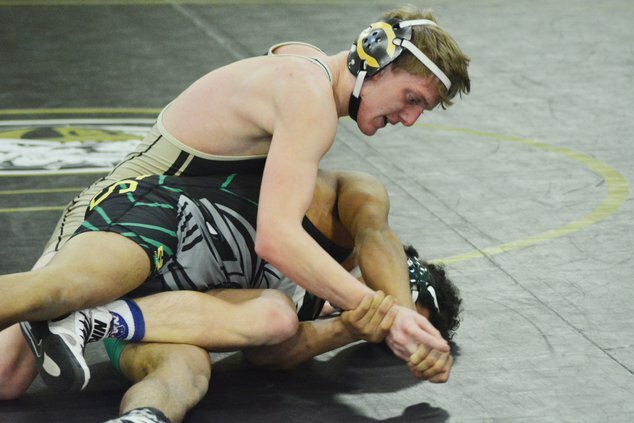 For NC, senior 170-pounder Hunter Haven is still on the mend from a knee injury which has kept him out since the early stages of the season. Tuesday, the Knights were also minus 113-pound starter Paula Perez, who is dealing with a shoulder injury suffered in the Blue Devil Invitational. 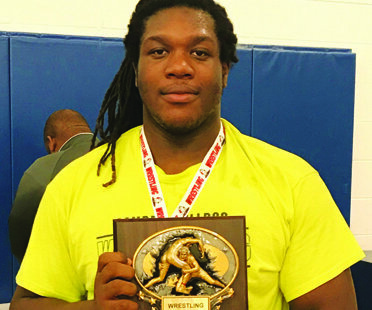 Camden was forced to forfeit six points at 220 pounds as starter Kionte Hayes weighed in at 220.1 pounds while giving NC another six points at 152 pounds. 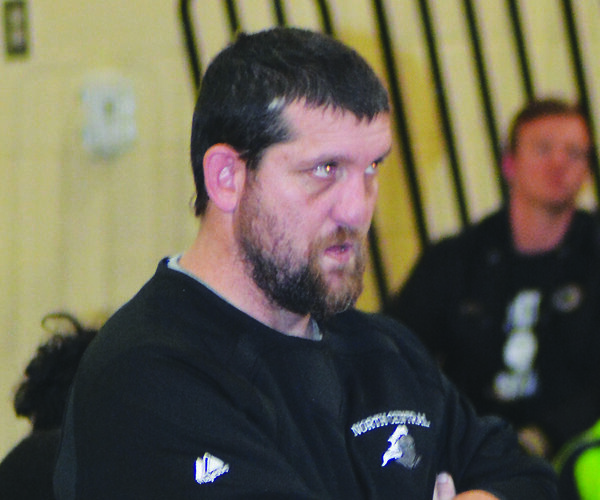 With his team eyeing the Region 4-AAA duals at Indian Land, which will determine the conference champion and state tournament seedings on Jan. 26, Sisk said the Bulldogs’ health is one of two areas which have him worried as the season heads down the home stretch. “The biggest concern is making weight,” Sisk said. “We’re beat up and we’re going to take this next week and a half to get healthy before the region championship. We’ll see if we can’t do something with Indian Land (ranked first in AAA); I know they have a good team. And, Chester (ranked fifth in AAA) has a good team. 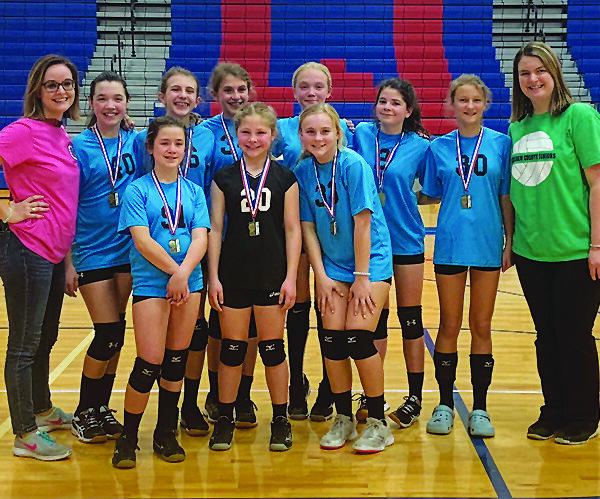 The in-county match served as the main course on an evening in which Spring Valley was an appetizer. The Knights crushed the 5A Vikings in the opener, 72-12, before Camden breezed to a 63-6 win over the visitors from Columbia. Camden took the 182-pound opener in the nightcap as Jyheem Macklin led NC’s Zycurtis Elgin, 6-5, after one period before the Bulldog senior scored a pin for a six-point win with 1:37 left in the second period. An NC forfeit to Clenzo Foreman at 195 pounds raised the lead to 12-0. The visitors cut the deficit in half at 12-6 when Jack Tilton won by forfeit at 220 pounds. The Bulldogs added another six points to their total with senior Jevontae Salmond getting a second period pin against NC sophomore Miles Stukes. A Jaime Carrera pin of Dalton Smith, some 67 seconds into their 106-pound encounter, put the Dogs in control at 24-6. With Perez out, Camden 113-pounder J.J. Rabon grabbed a 7-0 lead over Jake Wilson before scoring a pin at the 1:13 mark of the second period. When the Knights forfeited at Jaime Valenzuela at 120, it upped the ante to 30 points as the Dogs had a 36-6 cushion halfway through the match. Sisk said he was feeling pretty calm when the lead went to 30 points with seven matches left on the docket. While not satisfied coming away with the loss, Brazell said there was a silver lining to this night. In what turned out to be the closest match of the night, NC’s Kyle Lesso scored a takedown of Chandler Turner, 14 seconds into the one-minute overtime session for a three-point decision victory at 126 pounds. The two were knotted at 2-2 after one period with Turner matching a second period Lesso takedown with one of his own in the third period to send the match into the extra session with both wrestlers having scored four points each through the regulation six minutes. Leading, 36-9, Camden forfeited to Cameron Hoffman at 132 to shrink the deficit to 36-15. At 138, NC’s Corban Johnson stormed from the gate, taking down Hunter McCoy in the opening seconds only for McCoy to gather himself and get the clinching pin with 13 ticks left in the first period as the lead grew to 42-15. 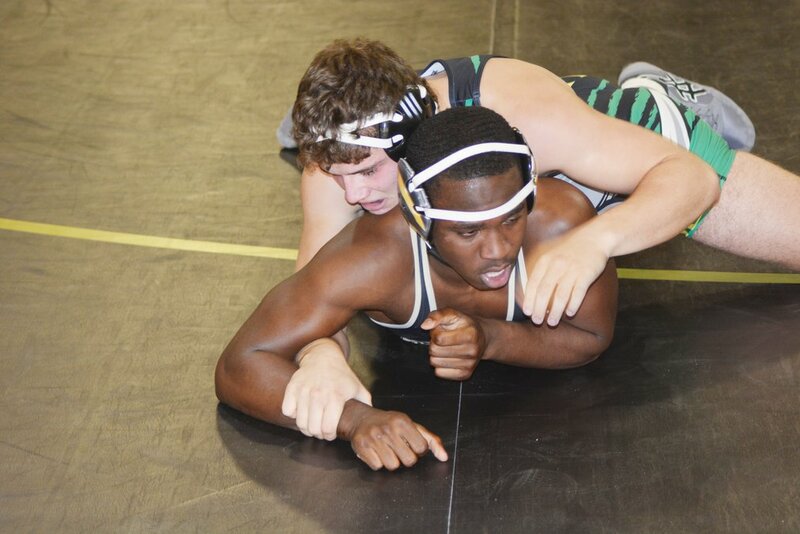 Carl Jones added Camden’s final three points of the evening as he outlasted Wade Bowers, 6-2, at 145. NC received a forfeit to Tyler Slayton at 152 before Jordan Small carried a 2-0 lead after one period over Jose Martinez at 160 pounds before Small took control of the match for the pin with 17 seconds left in the second period to make it 45-27 heading into the 170-pound affair won by Haven. Like Sisk, Brazell’s chief concern is getting his entire team well and back in the fold for the playoffs. 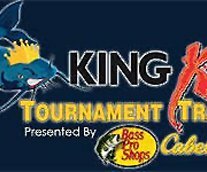 Having seen the Knights in two tournaments before Tuesday, Sisk knows Brazell and company will be a handful in the postseason. “It was a great atmosphere tonight,” he said. “If North Central is not going to win the 1A-2A state championship, I’d like to see the team who is. For the first time since last year’s state tournament, the end result did not go the Knights’ way. That, Brazell said, was not the worst thing which could have happened to his squad.